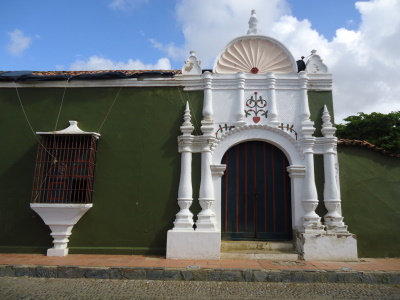 Coro and its Port contains some of the most important buildings of earthen construction in the Caribbean, dating from the earliest years of Spanish colonization in this region. The city Santa Ana de Coro was founded in 1527 by the Spaniards. It has conserved its original layout and early urban landscape very well. It presents a unique fusion of Mudejar architecture, native traditions, Spanish technical expertise and Dutch architectural influences. I visited Coro in August 2009. I think the historical significance of the site is probably the main reason for its inclusion on the list, rather than any significant colonial architecture. As the part of the city that shows off the colonial past is quite small, no more than nine or ten square blocks, even with visits to the museums most visitors will probably need no more than a few hours, half a day at most, to get a sense of the city and stroll the most interesting streets and plazas and get something to eat. I noticed the site is on the endangered list and obviously much has been done and is being done to restore and repair the colonial section and the plazas. Many of the buildings looked newly painted. Several of the churches and museums were closed for renovations and strolling should be left to the early morning or evening as the heat of the day can be quite oppressive. Coro is easily reachable by bus from nearby cities. The surroundings of Coro, including the sand dunes (be careful, I heard several reports of robberies in that area) and the Paraguana peninsula are worth a visit if in the area. Changed at inscription from "Coro and its dunes"
Earth Architecture: Coro's traditional buildings are built of earth - adobe, or earth reinforced in a technique known as "bahareque". Slavery: "Coro, French Republic of- Coro, a town in eastern Venezuela, was the center of a massive slave revolt in 1795. The revolt's leader, José Leonardo Chirinos, declared Coro a "French Republic" and announced that the new nation would govern itself by the ideals of the French Revolution. The Spanish government crushed the insurgents, and Chirinos along with his lieutenants was executed in December of 1796. The memory of Chirinos has been appropriated by the Bolivaran Revolution of Hugo Chavez and the airport of Coro has been named after him. Piracy: Attacked by Pirates and Privateers 1567, 1595 and 1659. Its fortifed Cathedral was used as a refuge. In 1659 the English pirate Christopher Mings with 3 ships took booty worth 200-300k in raids on Coro and 2 other Venezuelan ports. Cathedrals: "Pope Clement VII made Coro South America's first bishopric in 1531 , thus this Church became the first Cathedral." Name changes: On inscription, from "Coro and its dunes" to "Coro and its Port"